Between Ghana officially deciding to deregulate petroleum products with effect from 16 June 2015 to date, oil prices have more than halved falling from $65 per barrel to $36 per barrel as can be seen in the chart below. Within the same period, the Cedi enjoyed relative stability against her major trading currencies due to the Eurobond and COCOBOD loan inflows in Q3 2015. Consequentially, various Oil Marketing Companies reduced petrol prices at some point within the timeframe to reflect this underlying dynamic. For example, on 3 September 2015, petroleum prices at the pump sold for about GH₡3.070 per litre (US$0.78) and GH₡2.820 per litre (US$0.72) for petrol and diesel respectively compared to GH₡3.97 per litre (US$0.91) for petrol and GH₡3.73 (US$0.86) for diesel back in June 2015. 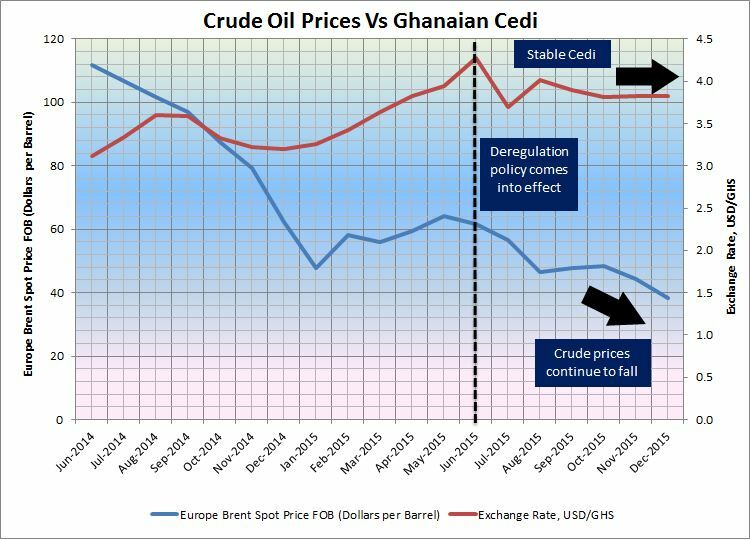 Two reasons accounted for this: (1) the marginal appreciation of the cedi to the dollar and (2) the fall in world crude oil price during the period. Interestingly, Ghanaian consumers should have been enjoying even cheaper prices at the pump by now given that the twin dynamics of a stable currency and continuous fall in the price of crude oil (the two fundamental market determinants) on the international market continues to positively affect a country that is a net importer of crude oil. However, given the gross management challenges that the economy has witnessed over the past three years, government finds itself in a precipitous situation of having to find more monies to fund the 2016 Budget instead of cutting or rationalizing expenditure. Hence, the only way to spend (i.e. meet the budget objectives) in an election year given the massive revenue shortfalls has been to burden consumers by slapping a hefty 27% tax on petroleum products despite non-changing fundamentals under the guise of the Energy Sector Levy (ESL) passed by our COMATOSE Parliament. One cannot also forget that the increment in prices of petroleum products parallels increases in electricity and water tariffs by 59.2 per cent and 67.2 per cent respectively by the Public Utilities Regulatory Commission (PURC), which took effect on December 14, 2015. For a government that claims its ideological roots in social democracy, I am left befuddled by this insensitivity in championing the economic welfare of the working class ― i.e. interest rates ridiculously totters in the high 30%; inflation is on the rise; consistent hikes in tariffs with little to show for by way of efficiency gains; wanton abuse of public procurement principles via sole sourcing; heavy burden of taxation (agricultural materials, outboard motors and medical supplies including condoms were even taxed at some point in 2013), etc. Whom does this economy really work for? Why not review expenditure instead? Why not review the award of hyper-inflated contracts with little value for money assessment that have become order of the day instead of burdening consumers — evidence in recent memory abounds from the AMERI Energy deal to the Bus Branding scandals? Why are we putting our eggs in one basket (i.e. oil proceeds) when production volumes and prices aren’t that big anyway, at least for now? The 2016 Budget passed by Parliament in November 2015 needs revision as the revenue projections cannot be met in this stagnating economy. However, the way out of this doesn’t lie in taxing consumers and businesses more. That is lazy economic management.